We are all guilty of curling up in our bed, or on our couch, with our laptops, tablets or smart phones to answer a few emails, do a quick search or log into our social media accounts. Then before we know it, a couple of hours have passed by and we are still hovering over our screens. Inevitably we have been sitting or curled up with rounded-shoulders in that classic head forward position. When we go to move, our neck and shoulders feel stiff or painful. The weight of our head and rounded shoulders puts pressure on the nerves traveling from the neck across the front of the shoulders. Its easy to for nerves to get pinched in this position and we then feel pain shooting from our neck into the shoulder and down the arm. This happens to us because of the head and body positions we fall into viewing our portable media devices in bed or on the couch. Our head is like a bowling ball, weighing about 10-12 pounds. For every inch it is tiled forward, we add 10 pounds to that head weight. This can easily can put up to 40 pounds of extra pressure on our cervical spine, nerves and shoulders. 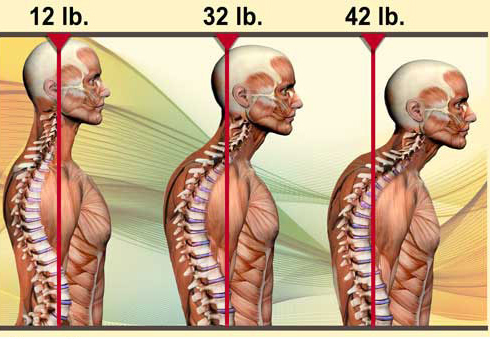 This extra weight of the head strains the muscles in the back of the neck. It also causes the muscles in the front part of the chest (the pecs) to become tight, pulling the shoulders even further into a forward rounded position. 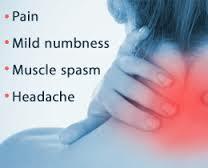 All this leads to pain, numbness, muscles spasms and even headaches. The sad thing is that we’ve done this to ourselves. Good body and head positioning is key to making sure technology doesn’t age us before our time, or give us a life of chronic pain. This video suggests one position of support and comfort at home you can use with your laptop or tablets that won’t result in pain. The platform suggested here can be used in a position lying down, or reclining. Each of which supports the weight of your head while viewing. You can find this platform very inexpensively on-line, or at IKEA for just $3.99. A small price to pay to keep you pain-free. View this video here.